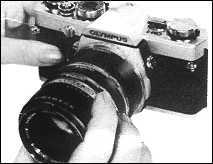 The first extension tubes that Olympus produced for the OM cameras were manual, with no provision for operating the automatic diaphragm in the attached lens or for full-aperture metering. 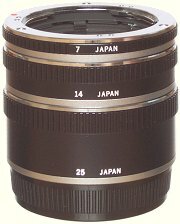 There does not seem to have been any good reason for producing manual tubes – all of the original OM lenses had automatic diaphragms, with the exception of the Zuiko Macro 20mm f/3.5, Zuiko Macro 38mm f/3.5 and Zuiko 1:1 Macro 80mm f/4 lenses, which were not intended for use with extension tubes. These manual tubes were replaced in 1980 by a set of automatic extension tubes. Apart from the difference in the diaphragm coupling mechanism, the automatic tubes can be distinguished by the word AUTO in front of the number that indicates their length. The Olympus OM tubes provide approximately 7, 14 and 25 mm of extension, while the Zuiko 50 mm f/1.8 standard lens has 7.5 mm of extension built-in, and in various combinations they provide from extension from zero to 54.5 mm with no gaps. The 50 mm f/3.5 macro lens that focuses unaided to ×0.5 covers the range ×0.5 to ×1.0 when used with the 25 mm extension tube. 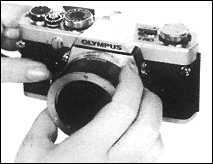 A manual extension tube fitted to a reversed Olympus OM lens converts the automatic diaphragm to click-stop operation, allowing the lens to be stopped down when mounted on a reversing ring; the automatic tubes cannot be used in this way. The tube also acts as a makeshift lens hood and gives some protection to the exposed rear element of the lens. The 7 mm extension tube provides enough extension to allow the release lever on the camera mount of the Auto Bellows to clear the overhanging prism on the Canon EOS 5D MkII and Olympus E-500 and E-510 digital SLRs. The 14 mm extension tube provides just enough extension to allow the release lever on the camera mount of the Auto Bellows to clear the overhanging prism on the Canon EOS 40D digital SLR. See also Auto Extension Tubes, Telescopic Auto Tube 65–116. Only one version of each length is known. The tubes are not marked “OM”, so there cannot have been any “M” versions. These were some of the very first OM accessories, and some boxes were made with the original “M SYSTEM” logo that was replaced in January 1973 by the familiar “OM SYSTEM” logo. These extension tubes are used with OM-System lenses to take close-ups of flowers, insects, and other small objects as well as for copying documents, maps, charts, etc. The focusing and viewing accuracy of the OM-System is of particular value in this type of photography. These three bayonet mount extension tubes (7mm, 14mm and 25mm in length) can be used with OM-1 standard lenses either singly or in combination to provide seven different extension lengths. Of special note is the 25mm extension tube which can be used separately to extend the magnification range of the ZUIKO macro lens 50mm to 1/2× and 1:1 (life size). When all three tubes are used in combination with the ZUIKO 50mm F1.8, you can achieve a life size magnification with a lens-to-subject distance just over 6.8cm (2 11/16″). OM-System macro lenses, optically optimized for best performance at specific magnifications, can be used with extension tubes to further enhance your macrophotographic ability with the OM-1 camera. For example, the ZUIKO macro lens 50mm F3.5 is designed to maintain high resolution throughout its entire focusing range and can be used with the 25mm extension tube for magnifications from 1/2× to 1:1. For best results focus and compose with the lens at maximum aperture. Depth of field is extremely shallow in close-up work. Therefore, using a small aperture such as F8 or F11 is recommended. Absolute camera steadiness is essential in securing maximum sharpness, of subject details. For best results, use a focusing stage, tripod and cable shutter release at all times. Do not exert unnecessary force when mounting extension tubes to the camera or lens. To keep the extension tubes in good condition, make sure they align properly between the lens and camera body whenever they are in use. Do not drop or mar the tubes and avoid dust on the contact surfaces. Always keep the tubes clean. Fingerprints, salt water, etc. should be wiped off immediately after each use. Avoid storing the tubes where temperature or humidity is high. Determine the combination of tubes you require based on the magnification desired and the subject area to be covered. Look through the viewfinder and turn the aperture ring until the meter needle aligns in the center of the fixed index as described on page 13 of the OM-1 SLR Camera Instruction Manual. Oblique-lined area indicates magnification ranges of standard lenses without close-up lens. Numbers printed at both ends of each arrow indicate distances in mm (inches) between lens and subject.